Home Business Global report Eurostat. How are the Europeans? Eurostat. How are the Europeans? One thing is sure: we live longer. 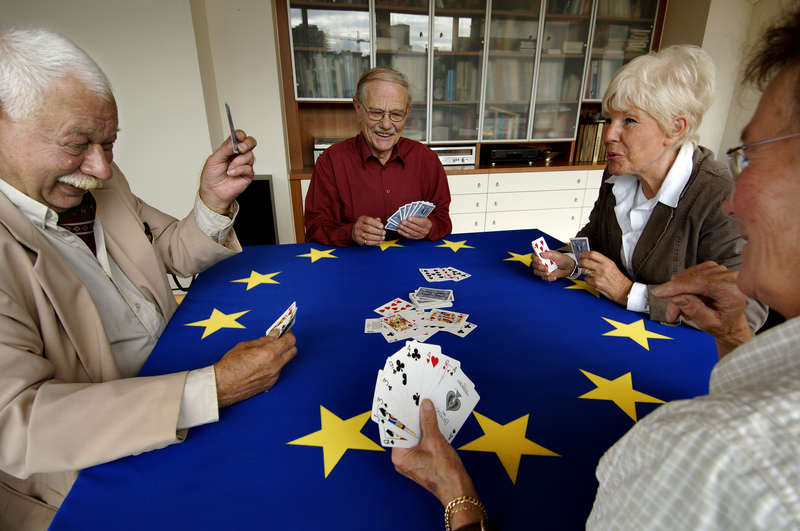 During last 10 years the Europeans have gained almost two years of life, 1.8 years to be precise. 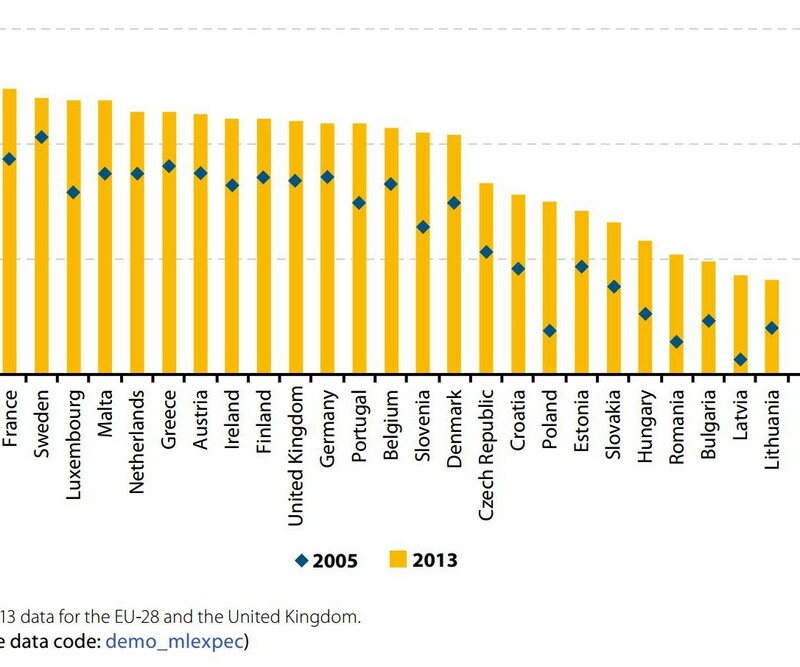 According to the last picture taken by Eurostat (Quality of Life. Facts and Views. 2015), the average life expectancy has reached 80.3 years. Italy is among the longest standing EU countries (average 82 years), the second after Spain and before Cyprus and France. Belong to the Eastern Europe (Lithuania, Bulgaria, Romania) the Countries with the lowest life expectancy (average 75 years), although significantly longer compared to 10 years ago. Women remain the most long-lived, with an advantage of 5.6 years compared to men. But if we consider the years without limitations related to a disease, the female advantage is reduced to 0.6 years, even lower than in 2005. Women therefore live longer, but those extra years are qualitatively damaged by a compromised health status. 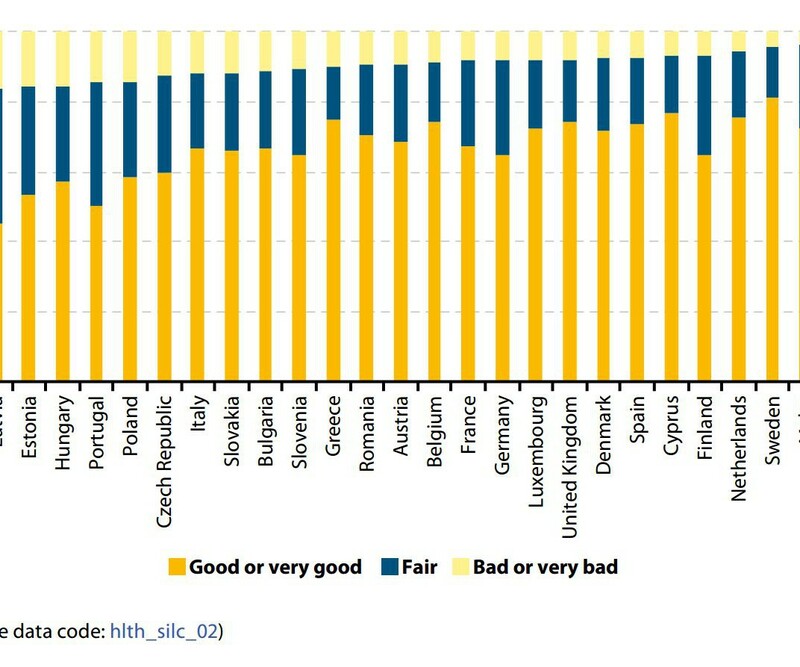 The majority of Europeans (67.7%) assesses its health status as good or very good, while one European out of ten judges it poor or very poor. The data relating to Italy are located in the European average, while Ireland, Sweden and the Netherlands are the Countries where people feel better. Instead, the last place of the list is covered by the Countries of Eastern Europe where only 50% of people has a positive perception of its health status and one person out of five considers it bad or even very bad. The health status, or rather its perception, tends to deteriorate with age, with the narrowness of the socio-economic and the onset of chronic disease conditions. 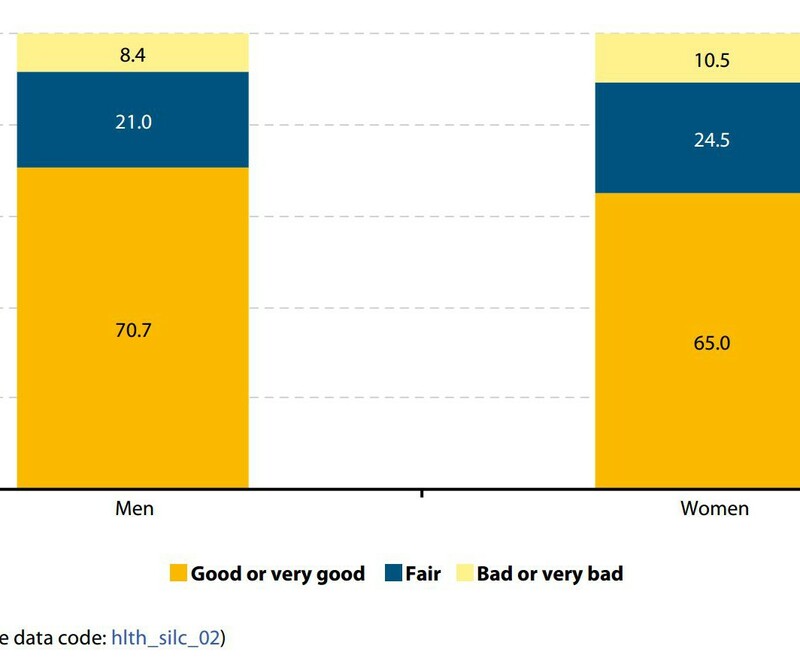 Men are more optimistic than women: more men than women (70.7% versus 65%) assess their health status as good or very good and a lower percentage of them judge it as bad or very bad (8.5% compared to 10.5%). 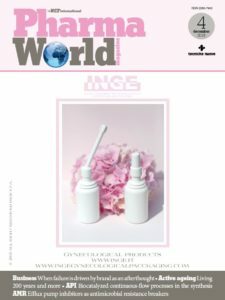 The reason of the greater “pessimism” of women could be related to the higher risk to fall sick, caused by longevity, and thus spend more years in precarious or damaged medical conditions, especially when the economic conditions are such that they do not fully support medical needs. Women are also generally more aware of their symptoms and clinical situations than men who are reluctant to admit to having a health problem. The economic availability and a good cultural level encourage a positive view of their health. The good socio-economic conditions in fact provide better access to healthcare, increased awareness and implementation of a healthy lifestyle and awareness of the importance of prevention. By contrast, the percentage of patients with chronic diseases is highest among the poorest people (35.9%). Obviously, the two-way relationship can be interpreted in two opposite ways; on the one hand the most humble economic conditions cause the lower level of health, on the other hand is the onset of a chronic disease that causes a problem of poverty (inability to work or loss of work activity). Work is another factor that significantly influences the perception of the health status. People who are following an education or training program (9 out of 10) or are full-time employees (8 out of 10) have the most positive view of their health status. 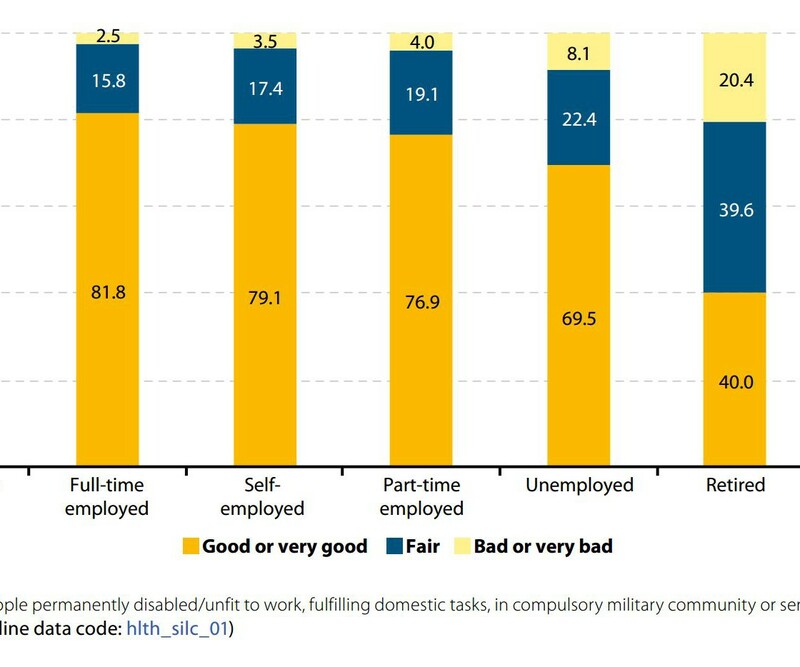 The situation becomes progressively less positive for freelancers, part-time employees, the unemployed and the retired; only 40% of them consider their health status good or very good. Although directly related, there is not always a correspondence between the real state of health and how it is perceived. 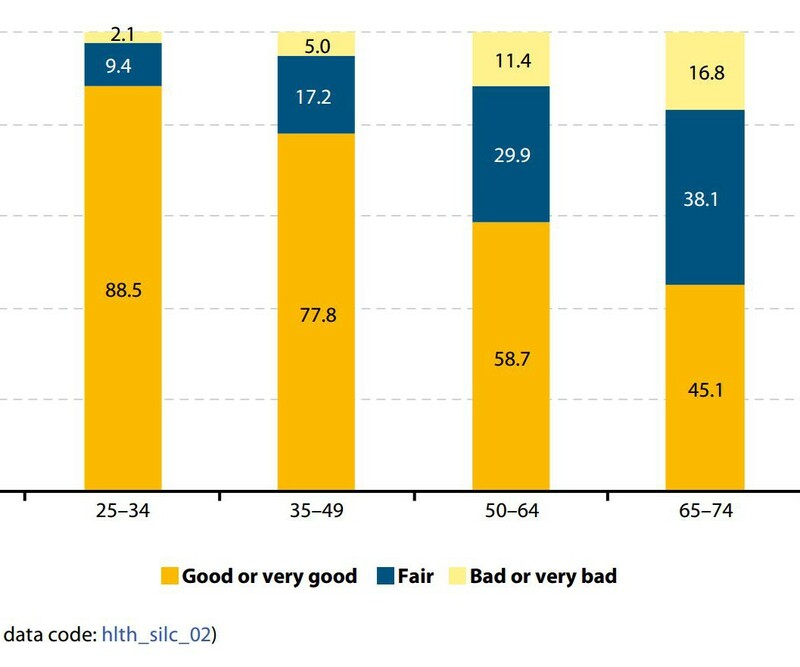 In 2013, even if a third of Europeans (32%) claimed to suffer from a chronic debilitating disease (+2% compared to 2005), only 9.5% of the population considered his health status bad or very bad. Almost 8% of Italians can not meet their own medical needs because of economic problems or the difficult access to treatments (distance to hospitals, length of the waiting list, etc.). This percentage is much higher, more than double, compared to the European average (3.6%) and is approaching to some Eastern European countries (Romania, Bulgaria, Poland, Estonia). The main causes of death are confirmed cardiovascular disease, chronic obstructive pulmonary disease (COPD) and cancers (breast cancer for women); the incidence have been reduced over the last 10 years. In particular, the male cancer mortality has dropped by 10% (female cancer mortality 5.5%) and the mortality caused by ischemic diseases has been reduced by 28.5% (30.4% for women).